This article features one of our clients, D’Amico Electric Inc of Westchester County, NY. 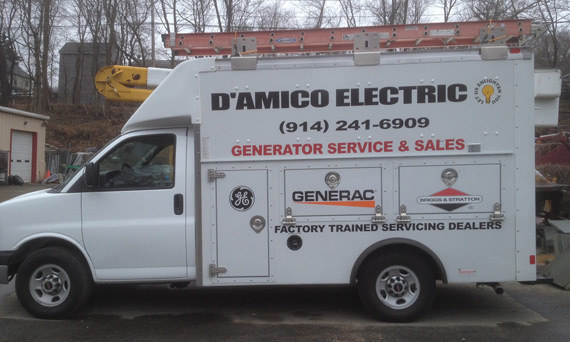 Visit them online at damicoelectriccompany.com or call them at (914) 241-6909. 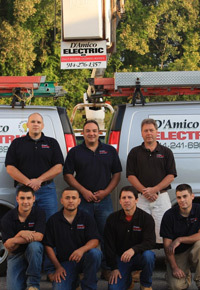 For over 20 years, D’Amico Electric has been serving the homes and businesses of Westchester County, New York, and vicinity. Providing a variety of commercial and residential electrical installations and repairs, we are fully equipped to meet all your electrical needs and exceed your expectations. Offering 24/7 emergency electrical services and licensed in Connecticut as well as in the counties of Dutchess, Putnam, and Westchester, New York, D’Amico Electric is your single source for all things electrical. Licensed master electrician Anthony D’Amico and his staff pride themselves on consistently meeting high standards of professionalism and service. With all the appropriate education, experience, and licensing required, the professionals at D’Amico Electric have earned their A+ rating with the Better Business Bureau, along with many positive reviews from long-time customers. • clean up the work area promptly. We consider it a pleasure to serve our customers in such a manner, and we give back by serving our local community by providing electrical services for local Habitat for Humanity projects, and taking part in other community events including contributing to the Jaxxon Reed Fund and being a sponsor for the Lewisboro fireworks. One of our main areas of expertise is installing and servicing all major brands of electrical generators. With our increasing reliance on electricity to perform both household and business-related tasks, homeowners and business owners alike are increasingly seeing the need to protect themselves against interruptions to power. We can set up cost-efficient portable generators or install stand-by generators that can detect outages and activate themselves immediately. When you entrust D’Amico Electric Inc. with your generator installation, you can rest assured that we will complete all installation-related tasks, from permit acquisition to start up. We’re also pleased to offer a new feature that can be added to many of our stand-by generators: remote monitoring. Through On Cue, Mobile Link and CRN, notification is provided to both to you as the homeowner as well as to the staff here at D’Amico Electric of potential problems before they actually occur. In addition, we now offer both annual and bi-annual service plans for all major brands of generators, including Briggs & Stratton, Generac, GE, and Kohler. With D’Amico Electric, you can rest assured that we’ve got your generator taken care of. With his entire career within the field of electrical contracting, master electrician Anthony D’Amico is a member of the Westchester Licensed Electrical Contractors Association. Along with our other technicians, Anthony consistently receives up-to-date technological training certified by the generator factories, ensuring that we can provide you with the latest in electrical expertise. From examples of our work to word-of-mouth recommendations and our reputation within the West Chester community, we are confident that when you check out D’Amico Electric, you will like what you hear and see. We look forward to your business and welcome your questions. Since 1994, the D’Amico Electric Company has been offering electrical contracting services for industrial, commercial and residential buildings. From backup generator installation & ongoing maintenance to landscape/accent wiring and home theater systems, our experienced technicians are here to serve you. With our fleet of 10 trucks, we provide emergency electrical services 24 hours a day. Visit our website at damicoelectriccompany.com.